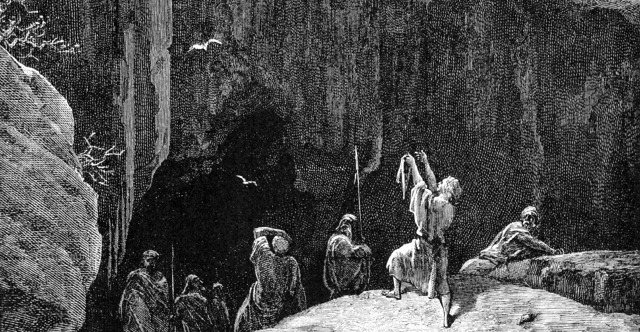 1 A Maskil of David, when he was in the cave. A Prayer. With my voice I cry out to the Lord; with my voice I plead for mercy to the Lord. 2 I pour out my complaint before him; I tell my trouble before him. 3 When my spirit faints within me, you know my way! In the path where I walk they have hidden a trap for me. 4 Look to the right and see: there is none who takes notice of me; no refuge remains to me; no one cares for my soul. 5 I cry to you, O Lord; I say, "You are my refuge, my portion in the land of the living." 6 Attend to my cry, for I am brought very low! Deliver me from my persecutors, for they are too strong for me! 7 Bring me out of prison, that I may give thanks to your name! The righteous will surround me, for you will deal bountifully with me.